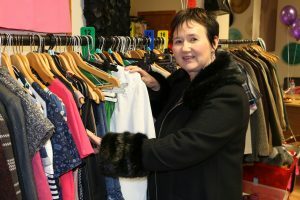 Friendly competition took hold of a newly-opened charity shop in Dundee on Thursday as members of the senior team from one the city’s biggest charities tried to sell the most stock during their shift. 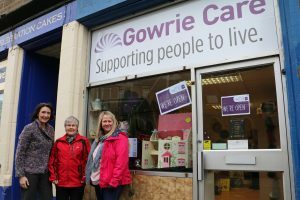 As part of the shop’s grand opening Hillcrest Group CEO, Angela Linton, Gowrie Care managing director, Joy Dunlop, and the chairperson of Gowrie Care’s board of directors, Janet Lynch, aimed to raise the most cash for the charity. Angela Linton said: “When it comes to fundraising we get very competitive but it’s all for a good cause. Janet Lynch said: “I’m really pleased to see so many local people embracing a new business and supporting Gowrie Care. 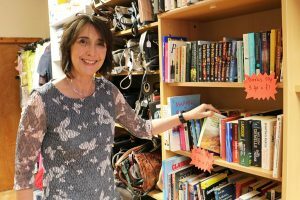 The Hillcrest Group fundraising and grants officer, Clare McNally said: “We have never opened a charity shop before but the pop up has proved popular so far. The shop, located on Albert Street until the end of May, is open 9am to 1pm Monday, Thursday and Friday, and 10am to 2pm Saturday. Gowrie Care, part of the Hillcrest Group of Companies, supports people in different settings throughout Scotland with physical and learning disabilities, mental health, Autism, homelessness and addictions.